I have a love hate relationship with Art and Farmers’ Markets. Places that have been putting food on the table and paying rent for our school these past three years. My experience has been they are a lot of hard work, yet every hour you work them your return on actual product diminishes (labor investment). I’ve met very few individuals who actually earn their living working the circuit. For most it’s just a way to support their hobbies and interact with people. And it’s that last part which is something you just have to experience and appreciate sometime as a woodworker. The business person in me will tell you that on average you will sell 10-15 percent of your inventory each market if you work it consistently. Most times it’s a little more than that but you have to offset the weeks you goose egg. Weekly art/farmers’ markets will run you $40-$60 to set up and require about 8 hours of work. But to be successful you have to work them consistently because at the price range most woodworking goes for lots of your sales are people who come back and not impulse buys. Monthly events usually run $125-$360 and many are two-day events with each day being 14-16 hours of work. There are also yearly events that many times run $800-$1,600 to enter. I know lots of people who work all year producing for one or two events and they’ll sell a much higher percentage of their inventory, but it’s offset with higher costs. But once again, consistency helps because people remember you and will seek you out at these events. So do the math. You have $3,000 in inventory of whatnot on a given weekend and you sell $400 at an event. You pay your booth fee, buy breakfast/lunch/dinner/hydration, then figure $5/hour for yourself to pay for loading, traveling, unloading, set up, market time, pack-up, travel and unloading. Of the four to six bowls, boxes, clocks, etc. that you sold, you have maybe 24 hours of labor invested plus a minor amount of consumables. Then you depreciate out all your tools and you find… ya, it’s a minimum-wage job that lets you keep doing what you’re doing. And that’s if you work it alone. Add a partner and divide all in half. Which is why I see so many retirees in the circuit. These past 4 years I’ve approached working markets more like a carnie booth than a retail shop. At every event you see me barking to the crowd, drawing them into a demonstration, getting them to laugh, putting a tool in their hands and covering them in sawdust. I’ve always got some kind of demonstration to do three main things: get people to remember somebody is teaching this stuff locally; show that craft is fun; and make small sales that’ll add up to pay the booth fee and cost me no more in time than I’m already spending (would you rather just sit in a lawn chair?). And it’s this interaction with the public via the work that introduces you to some of the nicest people you wouldn’t meet in your normal life. I don’t know what it is about woodworking, but it just draws people in. Maybe it’s that everyone has some connection to trees, or furniture, or memories of other woodworkers, but all of a sudden they’re on their best behavior when face to face with a woodworker making sawdust and eager to interact and help. A good example of this was the last event I worked. A lady was admiring our bowls while I was entertaining her kids by making tops. I was telling her where each tree grew up, that most all our turnings was just local stuff that fell in someone’s backyard. Then the next thing you know, she was telling me about a tree in her parents yard, a monster pecan that she just watched fall over one afternoon. Root rot from all the rain. A tree she grew up climbing, swinging into the river on, and that for her entire life provided the shade over the house in which she grew up. 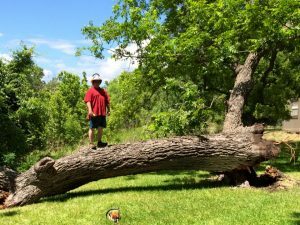 A little while later, she came back with a picture on her phone of her standing next to this monster of a tree laying down on its side and said that after talking with her parents if we wanted it we could have it. A week later I was standing next to this log talking to Bobby & Norma. He was a crop duster all over Texas for almost 40 years and the land they had along Pecan Creek had been in their family from before the country existed (the country of Texas, that is). Telling me the house he and his wife had built back in the late ’70s came from the sibling trees of this one that fell, but the stone stairs going down to the creek likely dated back to the 1700s. He was hacked that the state put an FM road thru the landing strip he built in his front yard where he taught his grand kids to fly, but also acknowledge he was getting a little too old to maintain the ultralights. Now when was the last time you met a nice guy who was crop dusting back in the ’50s, who taught kids how to fly before they could drive, and could trace his family history on a single piece of land back almost 300 years? I’d have never met this gentlemen or the hundreds of others like him if I wasn’t putting myself out there as a woodworker and welcoming the openness of the general public. The real income from working the tents and sharing your work and enthusiasm for the craft with others isn’t the money, but the people. So I suggest that sometime this year, gather up all the “stuff” you have around, put a fair price on it, figure out a fun demo to entertain the kid in all of us (whittling helicopter blades on a stick is easy and fun), share what you know, and meet some wonderful people outside your normal circle of friends.